“Opening the Door” can be a euphemism for discovery and learning. 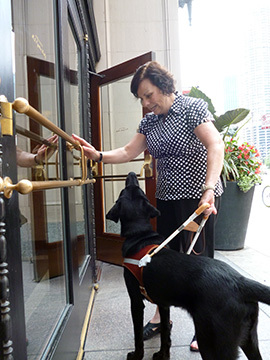 Today, I’d like to “open the door” and provide a little education on opening a door for someone with vision loss. I know lots of people out there have kind souls and a genuine desire to help someone in need. As a person with vision loss, I sincerely appreciate the kindness of strangers, especially when I’m in a pickle and need some sense of where I am or directions to destinations, even a doorway. Asking someone for help is one of the tools we keep in our “tool box” to help us get around independently. If you see me coming either with my guide dog or cane from the other side of the doorway, please, please don’t open the door in front of me! I cannot see you on the inside and a door popping open in front of me can injure my guide dog or me. Please wait for me to pass through and then proceed. If you are holding the door open for me, please SAY SO! I cannot see you or the open doorway. The door handle is my tactile cue (and my dog’s) that I have arrived at my destination. If you ask me if I’d like you to open the door for me and I say, “No, thanks, I can get it,” please honor my request. I may be training my guide dog to find that particular door. When this happens, it confuses my dog and me and can nullify the training I am trying to give my dog. If you’d really like to help and see that I may be struggling a bit to find the door, please just ask if you can be of assistance. I may ask the address of where I am to confirm I have the correct location. If I’m at the wrong location, I may ask you to help me find the correct address. Generally, when a person with vision loss travels independently, we have a good idea of where we are going. We may not hit our destination spot on, and your help to get us there is greatly appreciated. If we say “no, thanks, I’m okay,” we are probably okay and in no need of assistance. Please don’t take our decline of assistance personally. It is not a reflection on you, but just the honest truth. Thanks to all you kind strangers out there who provide asked for and needed help to people with vision loss. You make the difference between a bad travel experience and a great one. Keep up the good work and be careful opening doors! Kathy Austin, CVA keeps our community of clients, volunteers, donors and partners engaged with the work of Second Sense. We agree that it would be helpful if individuals would make every effort to try to educate the general population; keeping in mind that they should stress they are stating their individual preferences and not speaking for all with vision loss. Thanks for these suggestions – and the reminder that it is always simple to ask the person if they want help and how to help. Generally people attempting to help are well-meaning but perhaps not-so-well informed. Intentions and outcomes may diverge! Sharon, Asking is always the best policy. Just like everyone else, people with vision loss have different preferences and different needs. Sometimes people with vision loss accept the offered help, even when they don’t need it, simply because they know the person means well and they don’t want to discourage that. Asking allows them to graciously decline and thank the person for their kind offer without any hurt feelings or frustrations. Thanks for sharing your thoughts!